Shot Caller is a 2017 American crime thriller film directed and written by Ric Roman Waugh. The film chronicles the transformation of a well-to-do family man into a hardened prison gangster, undergone to survive California's penal system after he is incarcerated for his role in a deadly DUI car accident. The film stars Nikolaj Coster-Waldau, Omari Hardwick, Lake Bell, Jon Bernthal, Emory Cohen, Jeffrey Donovan, Evan Jones, with Benjamin Bratt, and Holt McCallany. Jacob Harlon is a successful stock broker living with his wife Katherine and son Joshua. One night after departing a dinner, he unintentionally runs a red light, causing an accident that kills his friend Tom, who was riding in his car. His lawyer advises Harlon to take a plea deal, which will see him serving 16 months, instead of going to trial as he could do up to 7 years if he lost his case. Harlon agrees and is sentenced to incarceration at California Institution for Men in Chino. Upon his arrival, Jacob is shocked by the brutal realities of the prison environment. Heeding his lawyer's advice to stand his ground, he reacts aggressively when provoked by an African-American prisoner in the exercise yard. After being detained in the SHU (Secured Housing Unit), Harlon realized he has caught the attention of Bottles, the Chino shotcaller for the PEN1 (Public Enemy No.1), a violent white supremacist gang. Bottles, thinking Harlon attacked the African-American prisoner for racial reasons, offers him protection and entry into PEN1. In return, Harlon is forced to carry out various tasks, from smuggling heroin to killing a "snitch" within his gang. Harlon, nicknamed Money, begins to rise in rank and acquire gang-related tattoos. During a prison riot, Harlon gets caught on camera murdering another prisoner while protecting Herman Gómez, the leader of the Sureños. As a result, he is sentenced to several more years, effectively quintupling his original sentence. He tells Katherine to forget about him, and stops all contact with his wife and son. Eventually, Katherine files for divorce. Harlon's new convictions validate him as a gang member. He is transferred to Corcoran State Prison to be placed under maximum-security. Like other "heavy-hitters", he is only allowed one hour of "yard time" per day (which is spent in a steel cage, where he can talk to prisoners in adjacent cages). Eventually, Harlon is introduced to Jerry "the Beast" Manning, the head shot caller for the Aryan Brotherhood. For the last seven years, Beast has been managing the gang's activities from inside the prison via corrupt correctional officers. Impressed with Harlon's dedication, Beast promoted Harlon to his second-in-command. Harlon serves out his time in the SHU with no further incidents. Before Harlon is released, he is ordered by Beast to orchestrate an arms deal with the Sureños. At his hesitation, Beast tells him he has to continue serving the gang's interests in exchange for his family's safety. Upon his release, Harlon is greeted by Frank "Shotgun" and other gang members, including Howie, a young former soldier with no criminal record. He learns that the weapon cache was found by Howie while in service. Meanwhile, Harlon's parole officer Ed Kutcher is approached by Sheriff Sanchez and other heads of a task force. They believe Harlon is putting together a large arms deal, and Harlon is put under surveillance. Despite the surveillance, Harlon sets the deal in motion, while making arrangements to transfer his "clean money" to his wife. Harlon becomes suspicious of Shotgun, and discovers him working as Kutcher's CI. On the day of the deal, Harlon shakes off surveillance and kills Shotgun. Kutcher finds Shotgun's body and retrieves his cellphone. After Harlon's group retrieves the weapon cache, they head to the exchange location. Harlon texts the location's coordinates to Shotgun's cellphone. After warning Howie to stay away from the criminal life, Harlon forces him off the vehicle. After the deal is closed, the police force, along with the ATF and SWAT, informed by Harlon's text, rush in. Almost all gang members are arrested or killed, only Howie escapes the bust. Harlon is arrested, fully validated, and given life imprisonment with no possibility of parole. He turns down Kutcher's offers of full pardon in exchange for testimonies against Beast. He is brought to Beast, who realizes he deliberately fumbled the deal. Beast announces that Harlon's family will die, and signals the corrupt guard to take Harlon back to his cell. Harlon produces a handcuff key and a razor blade that he had smuggled in earlier. He overpowers the guard, locks him inside his cage then unlocks Beast's cage. After a brief fight, Harlon kills Beast. A blood-soaked Harlon looks at the guard, announces he is now in charge, and orders him to falsify the report to state that he acted in self-defense. Having assumed Beast's place at the top of the Aryan Brotherhood's hierarchy, he begins to serve his life sentence knowing that this was the best way he could truly protect his family. He receives a letter from Josh saying he and Katherine are moving on, and that he's forgiven him. Juan Pablo Raba as Herman Gómez, Leader of the Sureños and possible Mexican Mafia member. Matt Gerald as Phil Cole, a parole officer chasing some gang members. Chris Browning as Toby "Redwood" Simms, a high ranking Aryan Brotherhood member. On April 9, 2015, Bold Films came on board to fully finance and produce the crime thriller film, titled Shot Caller to be directed by Ric Roman Waugh, based on his own script. Participant Media developed the project, while Participant's Jonathan King would produce along with Michel Litvak and Matthew Rhodes of Bold Films, along with Waugh. In April 2015, Relativity Media acquired the US rights to the film for $3 million with a wide release commitment, and Sierra/Affinity was on board to handle international sales. Due to the fact that Relativity Media filed for bankruptcy on July 2015, the film's release was postponed until Saban Films acquired the U.S. distribution rights in April 2017. Principal photography on the film began on May 26, 2015 in Albuquerque and Santa Fe, New Mexico. Reviews for the film have been positive, with many reviewers praising Nikolaj Coster-Waldau's performances. On review aggregator website Rotten Tomatoes, the film has an approval rating of 63% based on 23 reviews, with an average score of 6.2/10. 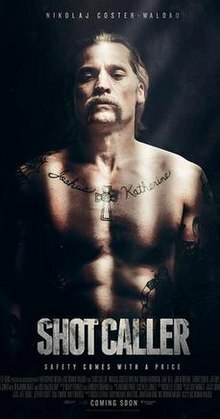 ^ "SHOT CALLER (15)". British Board of Film Classification. November 8, 2017. Retrieved April 1, 2019. ^ "Shot Caller". Box Office Mojo. Retrieved October 23, 2017. ^ "LA Film Fest's Closing Night Film: Matt Spicer's "Ingrid Goes West"". SHOOTonline.com. Retrieved 2017-05-16. ^ a b Busch, Anita (April 24, 2015). "Relativity Plunks Down $3M To Pick Up Bold Films' 'Shot Caller' With 'Games Of Thrones' Actor In Lead". deadline.com. Retrieved July 12, 2015. ^ a b c d e McNary, Dave (May 20, 2015). "Cannes: Lake Bell, Jon Bernthal Join Prison Drama 'Shot Caller'". variety.com. Retrieved July 12, 2015. ^ Pedersen, Erik; D'Alessandro, Anthony (May 28, 2015). "James Buckley Joins Lonely Island Pic 'Conner4real'; Evan Jones Set For 'Shot Caller'; Goldenthal Lauded In Krakow". deadline.com. Retrieved July 12, 2015. ^ Busch, Anita (May 27, 2015). "Benjamin Bratt Joins Bold Films' 'Shot Caller', Netflix's 'Special Correspondents'". deadline.com. Retrieved July 12, 2015. ^ Kroll, Justin (June 19, 2015). "Holt McCallany Joins Prison Thriller 'Shot Caller' (EXCLUSIVE)". variety.com. Retrieved July 12, 2015. ^ N'Duka, Amanda (April 30, 2015). "Rose McGowan, 2 Others Cast In 'Lower Bay'; Juan Pablo Raba Joins 'Shot Caller'". deadline.com. Retrieved July 12, 2015. ^ Kit, Borys (June 29, 2015). "'Daredevil' Actor Joins Nikolaj Coster-Waldau in 'Shot C,aller'". hollywoodreporter.com. Retrieved July 12, 2015. ^ Sun, Rebecca (June 29, 2015). "Michael Landes Joins Matthew McConaughey in 'Gold' (Exclusive)". hollywoodreporter.com. Retrieved July 12, 2015. ^ a b McNary, Dave (April 9, 2015). "Bold Films to Produce Ric Roman Waugh's Prison Thriller 'Shot Caller'". variety.com. Retrieved July 12, 2015. ^ Busch, David Lieberman,Anita (2016-03-18). "Relativity Media & Ryan Kavanaugh: A Walk Down Memory Lane Of Hype". Deadline. Retrieved 2017-05-16. ^ McNary, Dave (2017-04-11). "Saban Picks Up 'Shot Caller' Starring 'Game of Thrones' Actor Nikolaj Coster-Waldau". Variety. Retrieved 2017-05-16. ^ Gomez, Adrian (May 21, 2015). "'Shot Caller' to begin filming in NM with 'GoT' lead". abqjournal.com. Retrieved July 12, 2015. ^ "Casting Call in New Mexico for "Shot Caller" Feature Film". auditionsfree.com. June 20, 2015. Retrieved July 12, 2015.